The winners of the 2018 U.S. Stockholm Junior Water Prize were, from left, Bjorn von Euler Innovation in Water award-winner Madeline Kane, runner-up Michelle Xing, winner Braden Milford, runner-up Anjali Chadha, James L. Condon Recognition for Environmental Stewardship award-winner Helen Laird. Photo courtesy of AOB Photo. 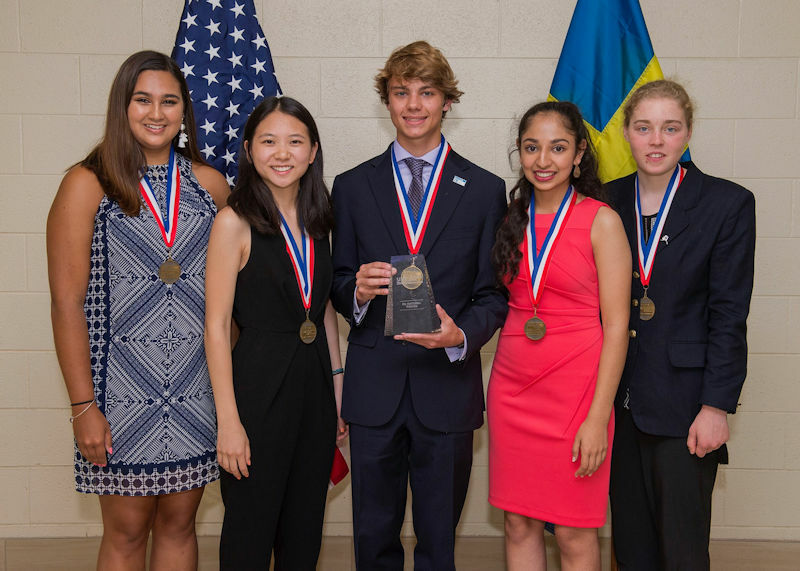 On June 16, high school students who have been selected as 2018 state winners traveled to the University of North Carolina at Charlotte to compete in the U.S. Stockholm Junior Water Prize (SJWP) competition. A total of 58 students, competing as individuals or on teams, represented 47 states and Puerto Rico in the national finals. Braden Milford from Oklahoma was chosen as the winner of the 2018 SJWP competition. He will receive $10,000 and an all-expenses-paid trip to Stockholm to represent the U.S. at the international competition during World Water Week, Aug. 26–31. Two students named as runners-up in the competition were Anjali Chadha from Kentucky and Michelle Xing from New York. The Bjorn von Euler Innovation in Water Scholarship Award, a $1000 scholarship sponsored by Xylem Inc., was awarded to Madeline Kane from Nebraska for demonstrating a passion for education, the spirit of creativity, and innovation. Helen Laird from Alaska was chosen to receive WEF’s James L. Condon Recognition for Environmental Stewardship award. SJWP aims to increase students’ interest in water-related issues, research, and careers as well as to raise awareness about global water challenges. The competition is open to projects focused on improving water quality, water resource management, water protection, drinking water, and wastewater treatment. WEF and its Member Associations organize the regional, state, and national competitions with support from Xylem Inc. (Rye Brook, N.Y.), a sponsor of the international competition.